in a few seconds -- or, you can click the Administrator graphic to go there now. Once there, PLEASE sign up for the notication service at the bottom of the home page. Thanks, the folks at BSM. World War I brought labor shortages to many major cities in the United States and Baltimore was no exception. For the first time in its history, the United Railways and Electric Company hired women as conductors and later, motormen, to work on the cars to replace the men who had gone off to war. 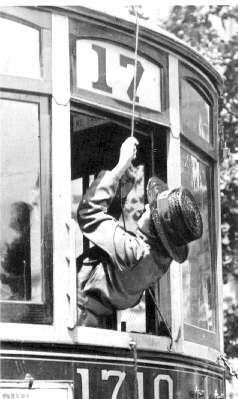 In this picture, the straw-hatted conductorette, as she was known, is adjusting the trolley pole on a streetcar. 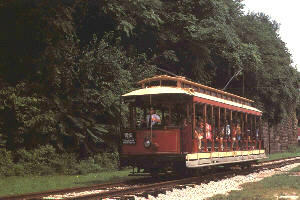 Route #17 cars ran from Gorsuch Avenue and Harford Road to Westport until June 1947. BSM is a non-profit, 501 (c)(3) museum , dedicated to preserving Baltimore's public transportation history, especially the street railway era . South on JFX(I-83), North Avenue exit, east on North avenue, two blocks to Maryland Avenue, south on Maryland Avenue. December 5, 2005 PLEASE reregister for notifications. This Baltimore Web Ring site owned by Thom LaCosta.